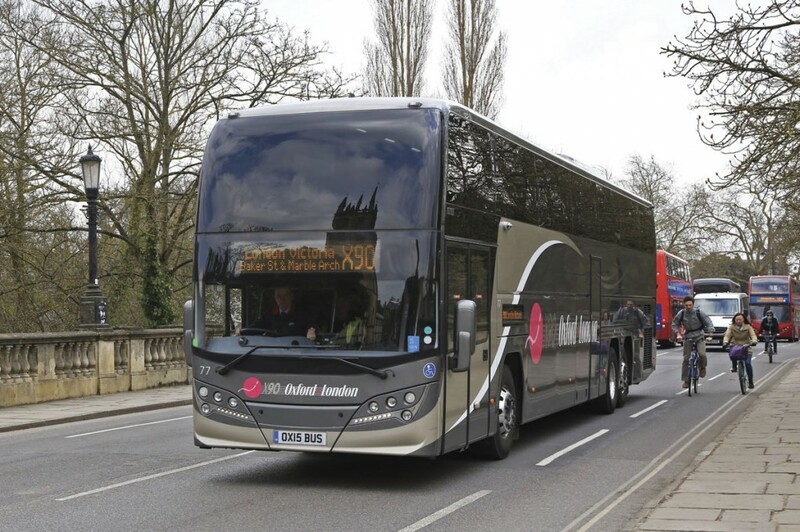 Oxford Bus Company has invested £2.5m in a fleet of eight Euro6 Volvo B11R 6×2 based Plaxton Elitei coaches to add capacity and further reduce the environmental footprint of the X90 service to central London. The new vehicles were formally launched at Oxfordshire County Council’s Thornhill Park and Ride, one of the service’s en route stops, by Oxford East MP, Andrew Smith. 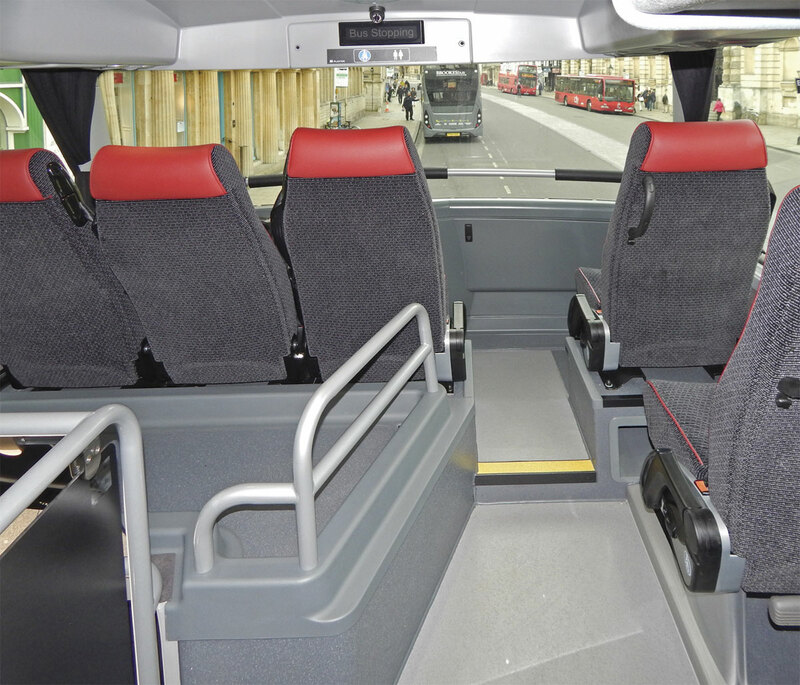 With experience from the operation of five Elitei coaches delivered in early 2014, Oxford Bus Company has specified a number of revisions to the entrance and interdeck areas which improve accessibility and maintain excellent legroom. To achieve this, a capacity of 63 seated plus one wheelchair has been chosen. By placing three plus one seats across the front and dispensing with all but one single offside seat in the second row, it has been possible to provide additional headroom inside the entrance and an easier staircase. The lower deck has just two priority seats behind the driver together with a wheelchair position featuring a demountable restraint system which is stored in one of the side lockers when not required. The Politecnica GTV reclining seats, trimmed in grey moquette with red leather headrest inserts and piping are spaced to allow passengers to comfortably work with a laptop making use of the on board 4G Wi-Fi. The three-point belted seats are fitted with armrests and have access to charging points, both 240V and USB, for electronic devices alongside each seat pair. Steps to the centrally placed nearside second exit also access the on board toilet and a full camera system increases driver and vehicle security. Running costs of the new Euro6 vehicles are not expected to be materially different from the vehicles they are replacing whilst retaining existing frequencies means no impact on driver costs. 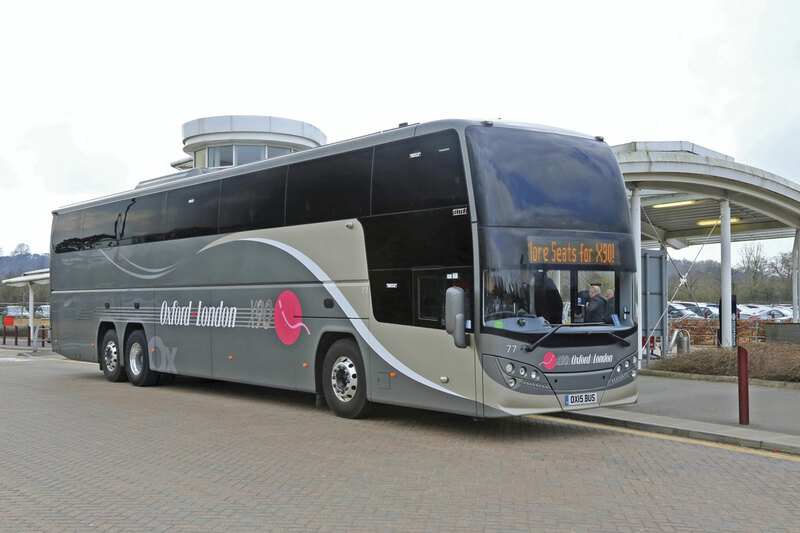 Phil reported that the value of the additional capacity of the initial generic Elitei delivery had been proved regularly on the Airlink services where peak loads and duplication requirements could appear almost without warning at any time of the day or night. Now a specific brand, the X90 linking Oxford with London can be traced back to National Bus Company days. 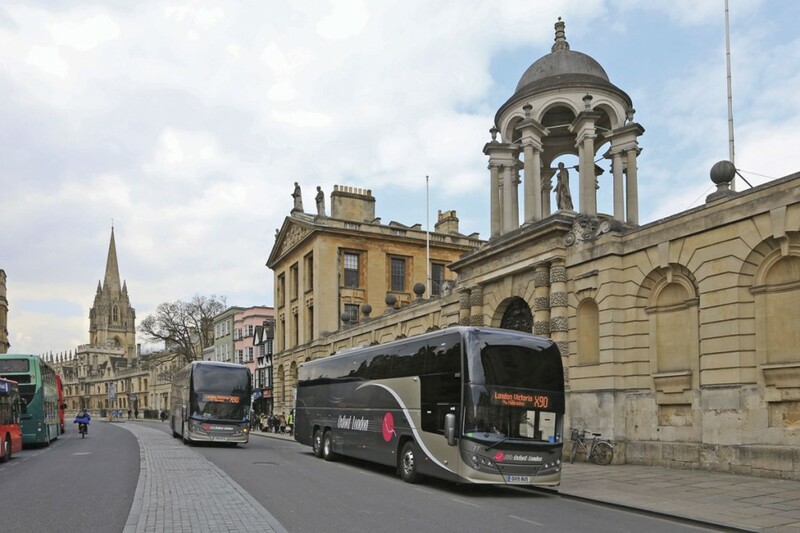 Through evolution and competition, Oxford Bus Company has developed it into an almost 24/7 operation with frequencies of up to four coaches an hour. 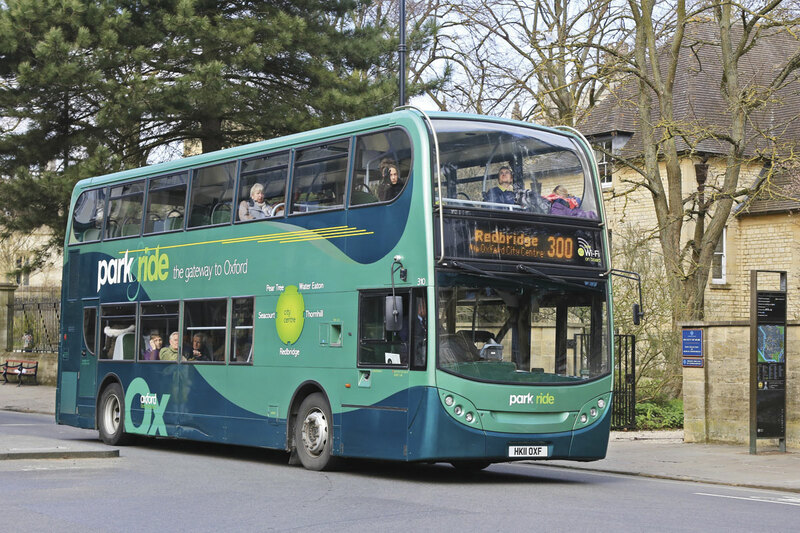 In addition to Gloucester Green coach station and Thornhill Park and Ride site, six stopping points are served within Oxford with local fares available. Hillingdon is served en route providing both interchange with TfL’s Metropolitan line and attractive local fares to the service’s three destinations in the capital, Baker St, Marble Arch and Victoria. 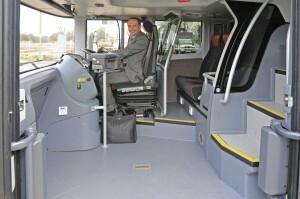 Alongside the investment in vehicles, Oxford Bus Company has invested significantly in ticketing technology for the X90. The mobile ticketing app for smart phones allows a wide range of tickets to be purchased in advance and activated when required. 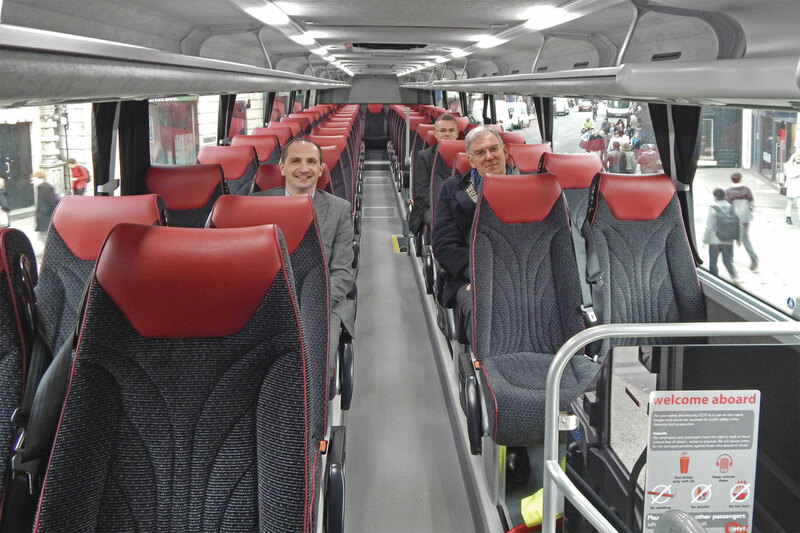 Further development of the technology is underway to support dynamic capacity management which, coupled with the additional seating capacity, will give added certainty to passengers away from the termini, particular the popular final London pick up at Baker St. The timetable brochure quotes a running time of around 100minutes although traffic conditions in both London and Oxford can seriously impact on this. Schedules have recently been revised to suit and provide additional resilience for afternoon departures from London. 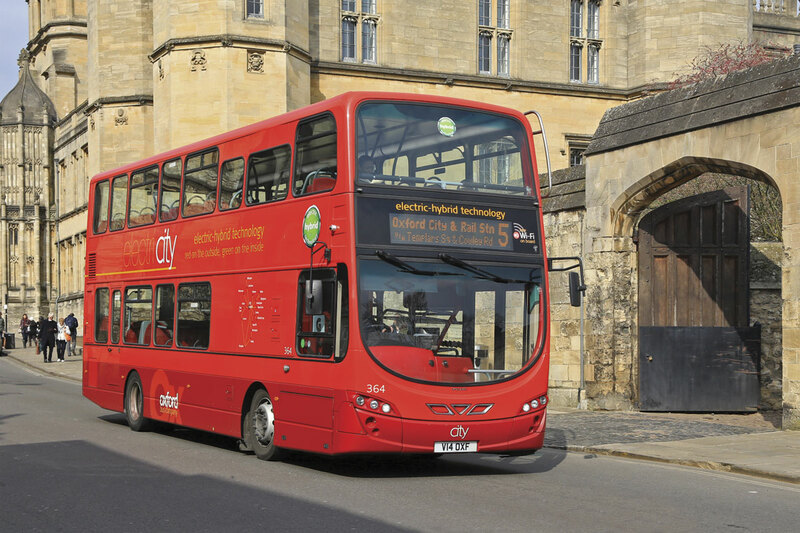 Roadworks on several key routes into Oxford alongside major development activities around the city centre are proving a challenge for all bus operators in the area. LEP funding availability has seen a number of these development projects having to be progressed concurrently. Another consequence of the development work has been the need to relocate long stay coach parking to Redbridge park and ride site, some distance from city centre pick up and drop off points. An LEZ covering city centre streets and approach routes was introduced by Oxford City Council on 1 January 2014. 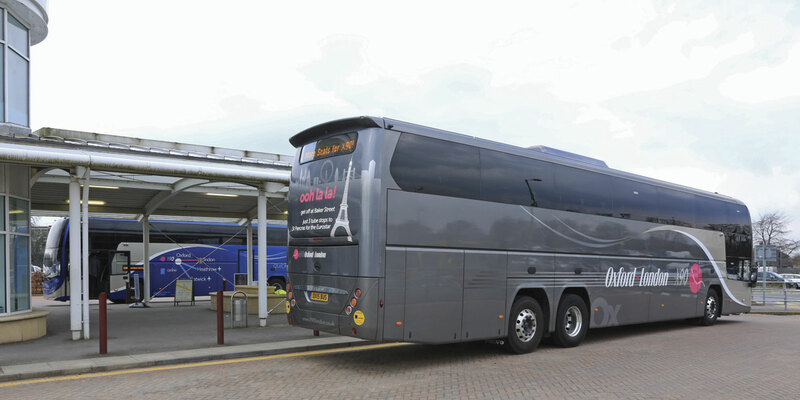 It requires buses using these routes and operating to at least an hourly frequency to be to Euro5 or better emissions standard and is enforced through a Traffic Regulation Condition (TRC) issued by the Traffic Commissioner. With continuous investment in new vehicles, including both ADL and Volvo hybrids together with retrofitment of selected earlier vehicles, Oxford Bus Company’s fleet meets or exceeds the requirements and the new X90 coaches provide a further advance. Vinyls on many of the company’s vehicles, particularly the retrofitted Mercedes-Benz Citaros, proclaim their compliance with the LEZ requirements. Further evidence of Oxford Bus Company’s drive to improve its home city’s environment was released immediately before the X90 launch with the announcement by Oxfordshire County Council and Oxford City Council of a joint study for a wireless electric bus project involving Oxford Bus Company, MBK Arup Sustainable Projects (MASP), and eFleet Integrated Service (eFIS). 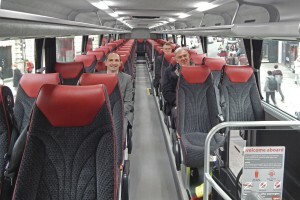 MASP, a joint venture company between Mitsui & Co. Ltd and Ove Arup Partnership Ltd, working with eFIS implemented the electric single deck bus trial in Milton Keynes. 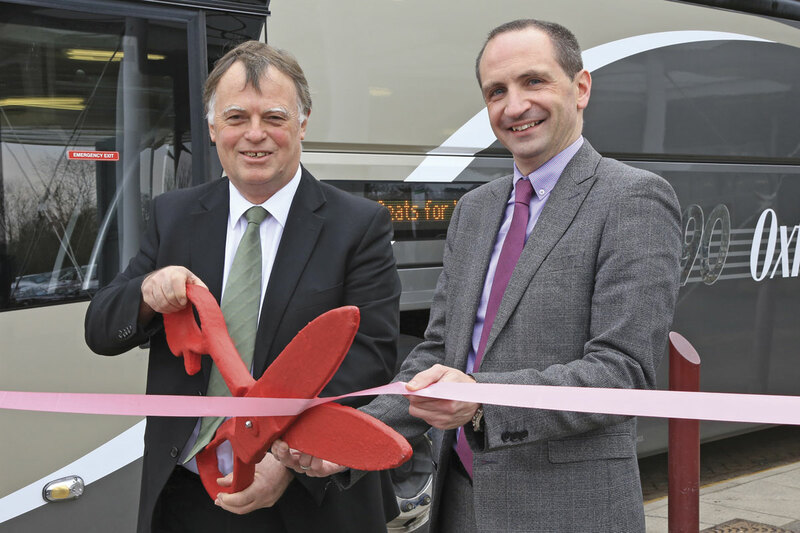 The joint study will look at the technical and commercial feasibility of replacing the existing park and ride buses with a fleet of around 20 new inductively charged electric vehicles, the first such double deck vehicles to operate in the UK. The buses will recharge when power transmitted from a coil buried in the road at the Park and Ride stops is picked up by a similar coil on the underside of the bus. Ten minutes parked over a coil will replenish the energy needed for the bus’s route.